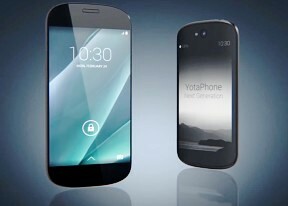 YotaPhone 2 runs on Android 4.4.3 KitKat and its stock Google apps, including the Google Now launcher, come updated to their respective latest versions. The icons, the app drawer and the system apps look similarly to what we've already seen in Android Lollipop and some people might even think the OS is indeed Android 5.0. Yota has confirmed it will bring Lollipop update later this year, which, of course, is quite nice though hardly specific. The lockscreen is the usual Android affair - it supports widgets (one per pane), plus there is a shortcut to the camera at the bottom courtesy of Android KitKat. There are a few available default widgets, but you can always get more from the Play Store. The Google Now launcher allows more than five homescreens and it looks just like on Android Lollipop. The leftmost pane is reserved for Google Now. Naturally widgets, shortcuts and folders are available. You can set various live and static wallpapers, too. The notification center is the usual stock KitKat one and Quick toggles are available via a shortcut to the right. You can get straight to these by with a two-finger swipe from the top of the screen. From there you get access to key device settings such as brightness, Wi-Fi, Bluetooth, location, mobile networks and Battery. Some toggles are directly accessible shortcuts to their respected functions in the settings menu. The app drawer is laid out across multiple side-scrollable panes. The apps are sorted alphabetically followed by the available widgets. YotaPhone 2 doesn't support custom sorting for the app drawer. The Recent Apps switcher is the same as on any other Android device. It would be nice if Google finally adds a kill all/close all option to this screen. Finally, Google Now integrates with your Google account and email and accesses your daily routine, internet searches, email, etc. and give you information relevant to your interests and daily needs. It provides traffic information to your work or home, knows the scores of sports teams you follow and gives you the weather forecast for your location. It's great for at-a-glance info, but can handle voice input as well. It also has a dedicated homescreen/lockscreen widget.